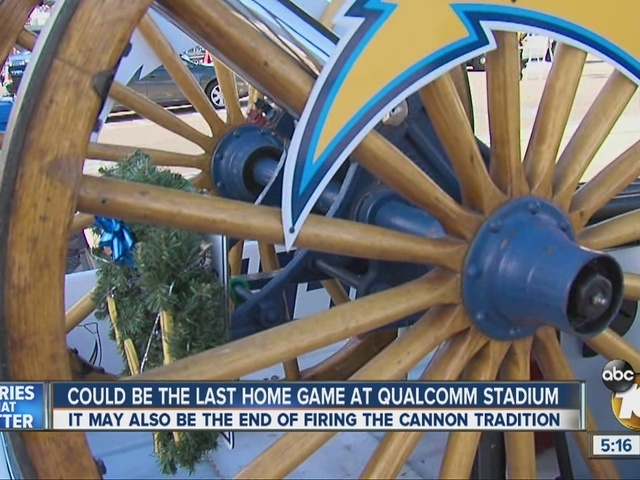 SAN DIEGO -- Philip Rivers and the rest of the San Diego Chargers knew it would be emotional when they played what could be the final NFL game in San Diego. 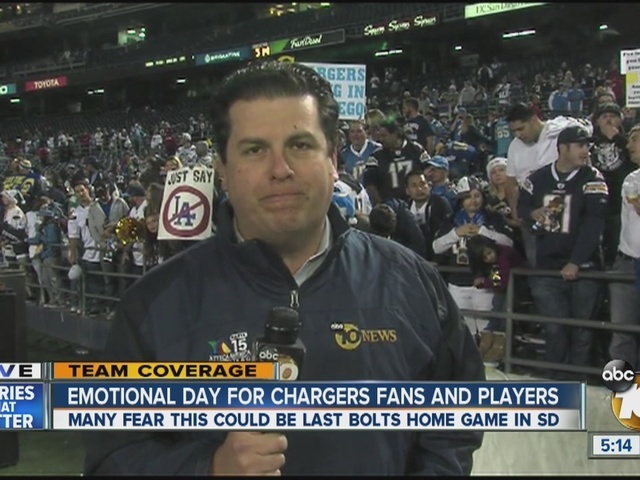 Not long after the Chargers beat the Miami Dolphins 30-14 in a matchup of last-place teams on Sunday, Rivers, Malcom Floyd, Eric Weddle and even coach Mike McCoy came back out to greet several thousand fans who don't want their team moving to Los Angeles. Floyd fought back tears, because he's retiring at season's end. Rivers, who will remain with the Chargers whether they stay in San Diego or move to Los Angeles, got a bit choked up talking about the franchise's history. "It was a special day, if it is the last one," said Rivers, who threw three touchdown passes to Danny Woodhead and watched as the mighty mite ran for another score. "I told the guys before the game, they've been playing football in this town before any of us were born, and there's people who're going to be at that game today that were coming to games before we were born. But we get to close it out, if it is the end. Hopefully the fans that have seen it over the years and the players that played in there can be proud today that we at least ended it the right way." Afterward, Rivers worked his way around the stadium signing autographs. He took off his shoes, signed them and gave them away. Rivers even signed two signs critical of team Chairman Dean Spanos, reading: "Spanos loves money and I love San Diego" and "Don't be the Grinch who stole the Bolts from San Diego." Spanos, who has been pushing since February to beat St. Louis Rams owner Stan Kroenke to Los Angeles, refused comment as he left the locker room with his two sons, who now run the team. Spanos wants to tap L.A.'s perceived riches. Woodhead caught touchdown passes of 20, 9 and 9 yards and scored on a 2-yard run. SURREAL SCENE: After the game, Jackson Browne's "Stay" and even "Auld Lang Syne" played on the sound system. Rivers, Floyd, Weddle and McCoy signed autographs and greeted fans. 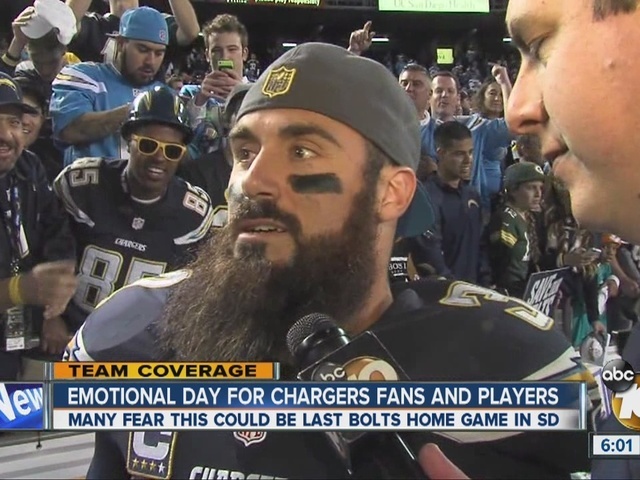 Once security and police cleared the remaining fans, Weddle, whose contract expires after the season, went to the Chargers logo at midfield and stretched out on his back. "I felt that's the least we could do," Rivers said. "It's more than just us that this affects, obviously, if it is the last time. "You want them to at least end it with a memory that was unique. At least just a token that, we thank you. If this is the last one, I'll always be sick that we didn't win a championship while we were here." THE CONTROVERSY: Spanos, who has been pushing since February to be positioned to beat St. Louis Rams owner Stan Kroenke to Los Angeles, refused comment as he left the locker room with his two sons, who now run the team. Spanos wants to tap L.A.'s perceived riches. NFL owners could vote on relocation next month. The Chargers and archrival Oakland Raiders want to build a stadium in Carson, while Kroenke wants to build one in Inglewood. Spanos was the target of several signs. One read, "Does 54 years mean nothing Dean? NFL?" The sign was off by one year; the Chargers have been here 55 years. FAREWELL TO FLOYD: In the fourth quarter, the Chargers played a video tribute to Floyd, who's retiring after 12 seasons in San Diego. He fought back tears after greeting fans following his final home game. Rivers tried to get Floyd a TD pass, but was intercepted at the 1 by Brent Grimes. With 37 seconds left, McCoy called timeout so Rivers, tight end Antonio Gates and Floyd could leave the game to applause. He did the same thing for Weddle. Those fans who stuck around to the end cheered at the final gun. PLAY OF THE GAME: Early in the second quarter, Rivers was intercepted by Reshad Jones, who weaved through traffic for 42 yards before guard Orlando Franklin stripped the ball. After a wild scramble, Rivers jumped on it. The Chargers moved down the field for Lambo's 28-yard field goal for a 9-0 lead. MIAMI MUSINGS: The Dolphins lost for the fourth time in five games. "I'm disappointed, frustrated, upset, mad, angry and any adjective you can think of right now," quarterback Ryan Tannehill said. "To come out and play like that on both sides of the ball is unacceptable in every sense of the word." Jay Ajayi scored on a 12-yard run in the third quarter and Tannehill had a 1-yard keeper late in the fourth.